The Sawdust City Brewing Co.: Ol'Woody is on Deck! Have you been to The Monk's Kettle? 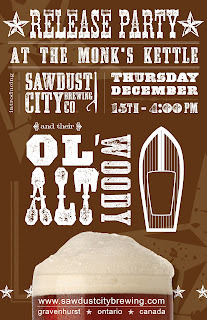 Have you tried Sawdust City's newest beer, Ol'Woody Alt? If you answered no to either of these questions, then we've got the cure for you! 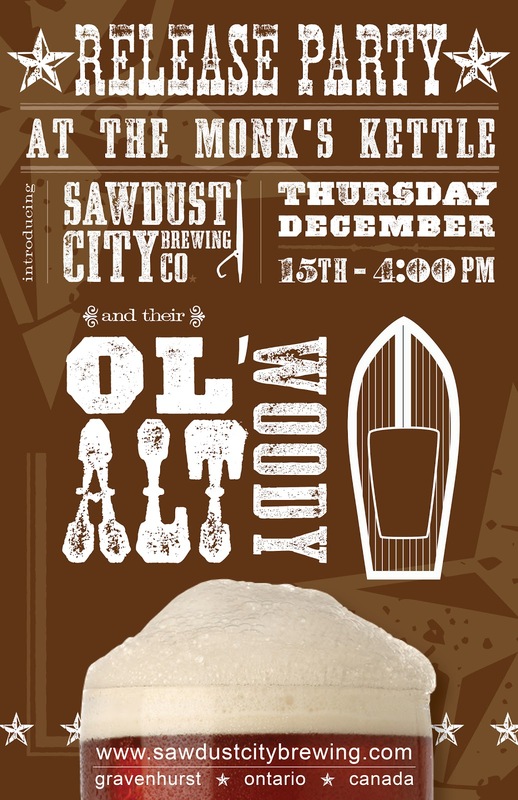 This Thursday, December 15th, starting at 4p, The Monk's Kettle (3073 Bloor St. W) will be hosting a release party for Sawdust City's second release, Ol'Woody Alt. A traditional German Dusseldofr Alt, Ol'Woody is a great beer for a cool fall evening. Paired with an appetizer created by The Monk's Kettle's chef, come out and try a sample of Ol'Woody in the pubs fantastic setting. They'll be featuring Ol'Woody all evening but there will also be samples of our Golden Beach Pale Wheat available as well. Hibernating until next Spring, this could be your last chance to try our inaugural brew before it disappears for the Winter. So come out for some after work drinks or stay for a fantastic dinner prepared by The Monk's Kettle kitchen crew, either way it's a great way to warm up for the Holidays!